If you don’t remember, I was a little down on last week’s episode. It felt really convoluted to me and I couldn’t get on board. It’s those episodes where I usually find myself taking a peek at the comments section a bit more. Sometimes your observations help reaffirm my thoughts or get me to look at things in a different light. There are a couple folks who always seem to put a good amount of time and thought into their analysis of the episode and it’s clear that there are some serious nerds (in a good way) out there with deep knowledge of the show. I bring that up because I’m curious what a lot of you thought about tonight’s episode. In the last blog, I mentioned that I was hoping for a bounce back episode of sorts and I think we got it with one of the better ones of the season thus far. Yes, the fact that a random city mayor (Ollie) would go with a mercenary (Slade) to a foreign country and believe he could act as some sort of liaison to secure the release of a prisoner seemed ridiculous to me, but I let it go for the sake of the story being told. I’m glad I did. The writers did a great job of leaving out the clutter and keeping things simple and direct. Tonight’s episode consisted of two elements: Slade and Vigilante. 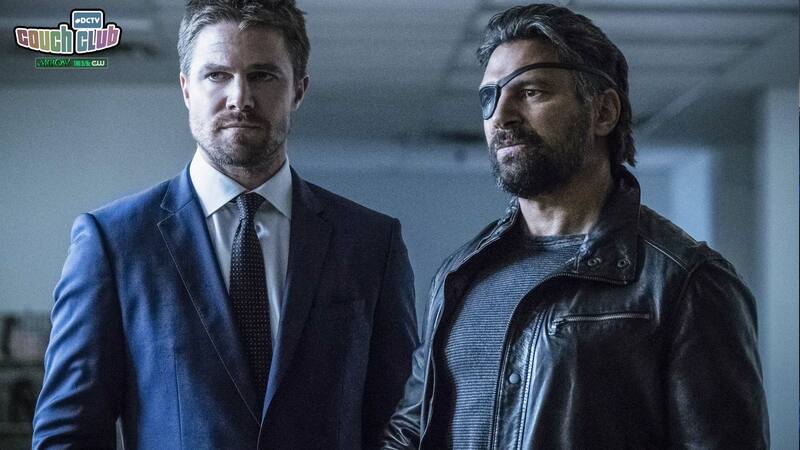 Fan favorite and resident badass, Slade Wilson, comes to Ollie for help with getting his son back at the same time Vigilante made his long-overdue return and we were introduced to a new band of villains calling themselves the Jackals. They even worked in some nice twists without overdoing it. The first came with the realization that Vigilante is the ex-lover of Dinah. I like this. It might serve to give a little more depth to her character. It seems like her somewhat cliché ex-cop backstory was put on the shelf since she first appeared. Tonight might be the start of shedding some more light on who she is—I mean, outside of being someone who can yell really loud. Initially, I thought it was a bad move when he removed the mask. To me, you lose the whole mystery of who this dude is and it’s that mystery that made him so cool. But, now that he’s maskless and we learned he’s connected to Dinah, that lost mystique has been replaced with the intrigue of wanting to know how these two are connected. But even more so, what exactly Vigilante’s deal is. The guy took a gunshot to the head and healed up within seconds. It’s clear he has some impressive powers. Where (or how) did he get them? Could there be future issues with Dinah? There’s clearly a conflict of interest there. It’ll be fun to see where they go with that. If Vigilante was the appetizer of the episode, then Slade Wilson is the main course. This is what made the show. Yes, we saw more flashbacks (ughh), but it was cool to see someone else’s memories besides Ollie’s. I liked the scenes of Slade and his son camping. Although, I had to laugh a bit when Slade tries skirting his son’s questions by saying he works for the airline. Ha ha! Obviously, Slade has a strong love for his son, which has been demonstrated for a while now and reinforced by his words to Ollie and the flashbacks we saw tonight. He’ll do whatever it takes to keep him safe—as demonstrated by that fantastic one-man wrecking crew fight scene towards the end. I must admit, I had a feeling something was kind of off when we saw his son being “kidnapped” from prison, but I didn’t quite connect the dots. Who goes through the trouble of kidnapping someone from prison unless it was to free them? So, it made sense when we learned he’s actually the leader of the Jackals and that was his crew busting him out. This was the second (and best) twist of the episode. I have to believe Slade’s son is an incredibly intelligent and skilled guy, so I’m really looking forward to learning more about the Jackals and watching Slade struggle with the fact that his son is most likely a pretty evil dude—which is the last thing he wanted for him.